A sea of marchers take up all eight lanes of Pine Island Road in Parkland for the March For Our Lives event there Saturday. 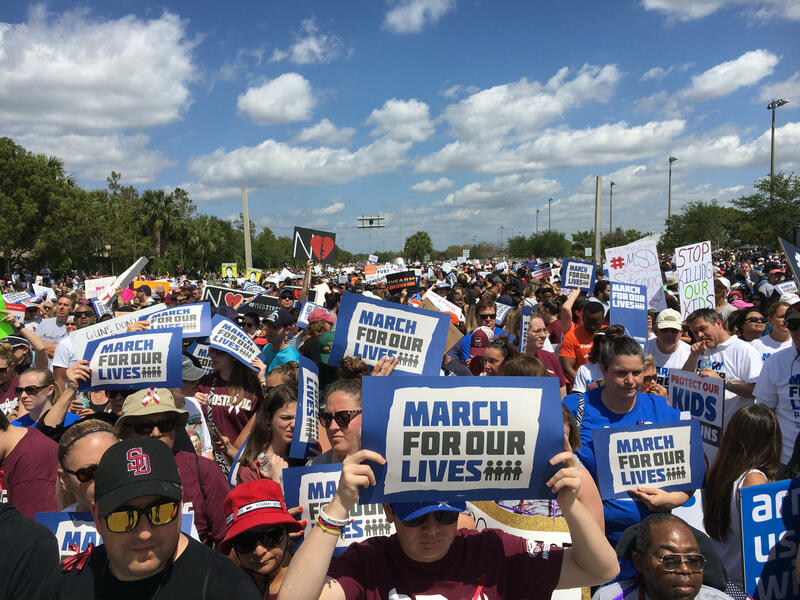 At Parkland's Pine Trails Park, thousands gathered for the 10 a.m. march chanting "Enough is enough!" and waving signs that read: "Am I Next?" "Protect Kids, Not Guns." "Take away your guns, not our lives." Among the groups marching are Mom's Demand Action. Marchers were also told they can register to vote at the rally by texting "fight" to 788-683. 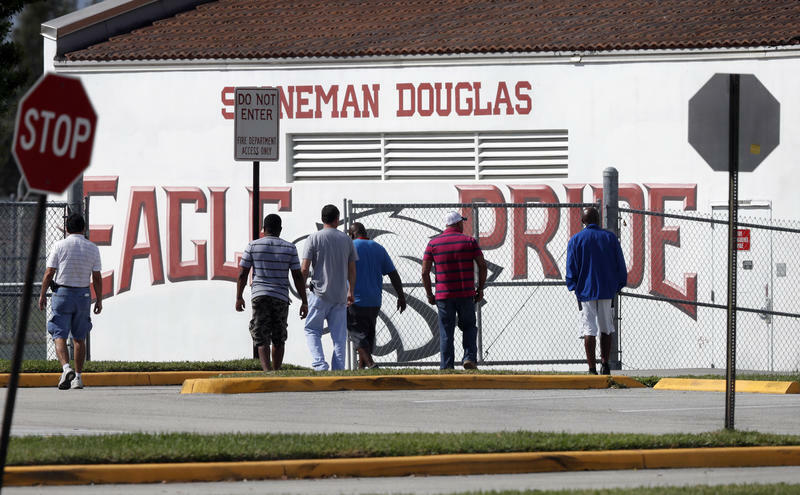 Before the two-mile Parkland march to Douglas High got underway, Douglas sophomore Sari Kauffman addressed the crowd saying: "Remember that policy change isn't nearly as difficult as losing a loved one." She also asked marchers to get 17 other people to register to vote. 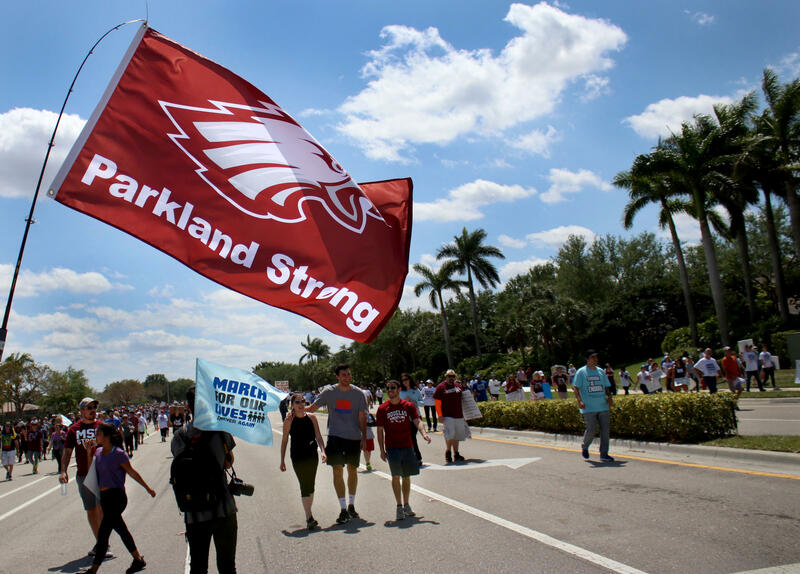 The Parkland marchers were only supposed to take up four lanes of traffic on Pineland Island Road - but the crowd became so massive they ended up filling all eight lanes. 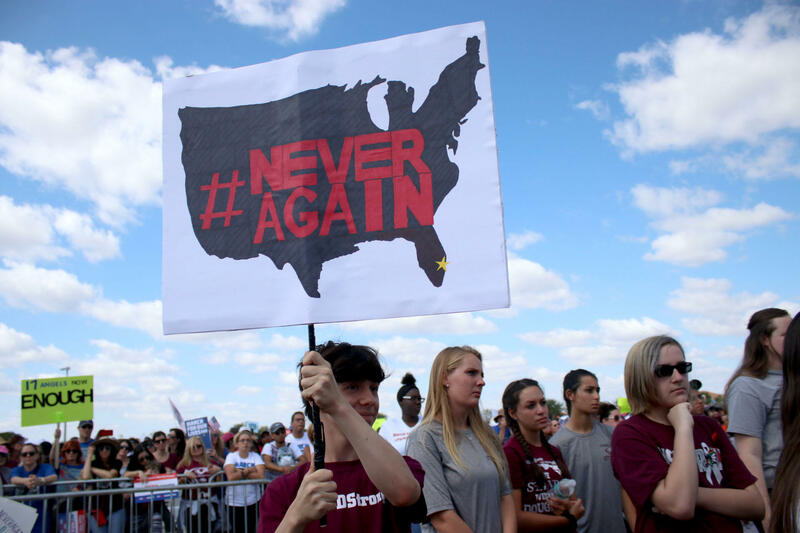 Teens hold aloft a NeverAgain sign before the start of the March For Our Lives event in Parkland Saturday morning. 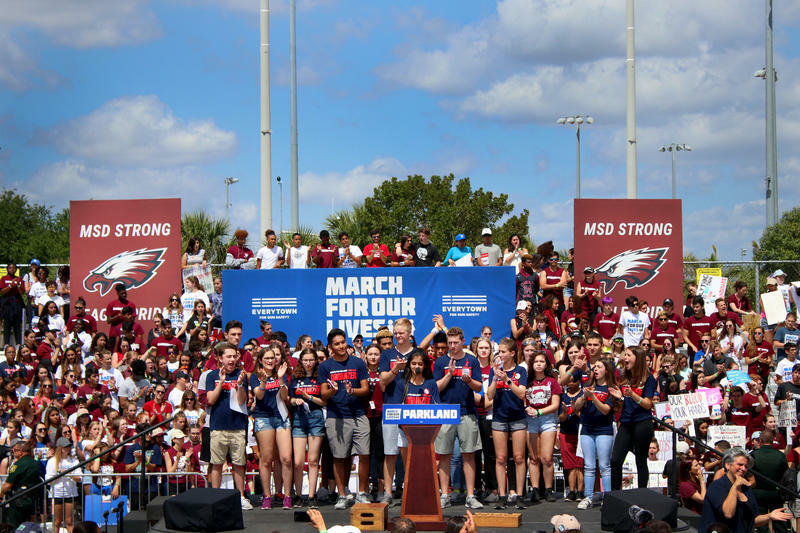 "I was feeling very proud, very inspired and very moved by the amount of people who showed up today," said Jesus Caro, who teaches speech and debate at Douglas High and also spoke at the pre-march rally. "Seeing the voice and the activism and the leadership that the students are expressing and living also brings a sense of comfort to your teachers, because we are seeing our work is valuable, is fruitful." Cameron Kasky - one of scores of Parkland students and parents who traveled to Washington D.C. for the main March For Our Lives event, spoke to the crowd there and demanded a ban on assault weapons like the AR-15 rifle used in the February massacre. "We hereby promise to fix the broken system we've been forced into and create a better world for the generations to come," Kasky said. "Don't worry, we've got this." Before the march in Miami Beach, Miami-Dade Schools Superintendent Alberto Carvalho took the stage at Miami Beach Senior High School and - targeting the powerful gun lobby - told the crowd: "Today is the day when we have the chance to turn tragedy into triumph...when we have the chance to speak up and take on special interests for the interest of our kids." 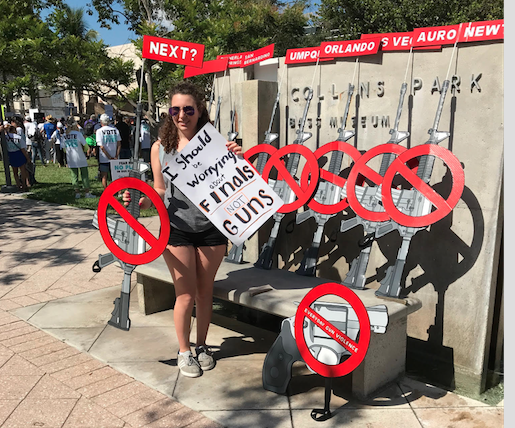 University of Miami freshman Rebecca Gladstone at Collins Park during the March for Our Lives rally in Miami Beach Saturday. 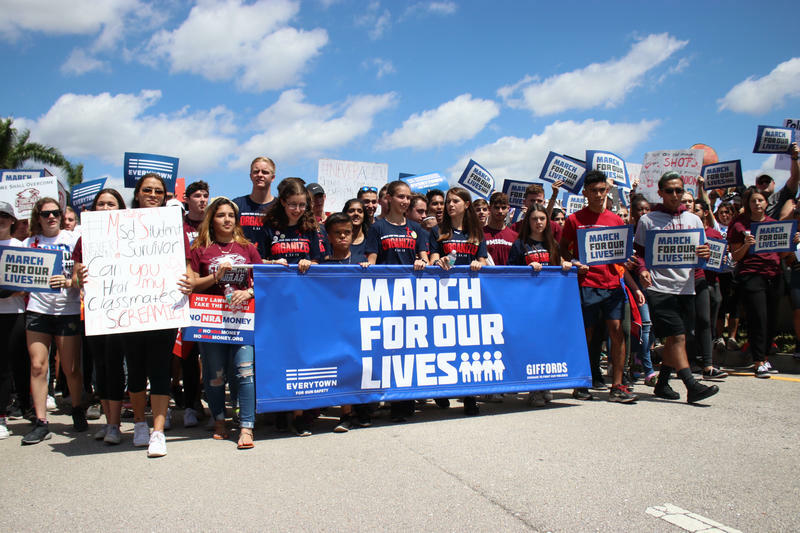 Carvalho's remarks reflected the tone of the Miami Beach event, where marchers directed much of their ire at politicians who get funding from the gun lobby. Activists there handed out orange "$1.05" price tags to sardonically symbolize what they argue is the value some politicians place on students' lives based on that funding. Many Miami Beach marchers tied the tags to their wrists or backpacks. "Politicians need to be held accountable for this because they're the ones creating laws," said Elijah Horesh, a Parkland native, Douglas High graduate and University of Miami student. "They are collectively our government, and they need to do something." 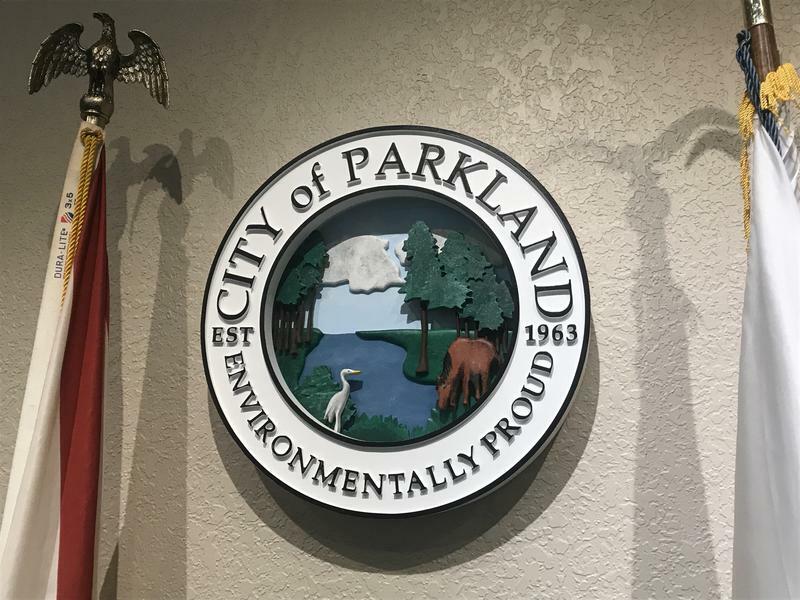 At Miami Beach's Collins Park, one of the march stops, Coral Gables resident Jasmine Folden said the effort led by "articulate, informed" Douglas High students might just lead to real legislative change. "Everyone should have been outraged when 6- and 7-year-olds were killed, but they weren't," said Folden. "And a lot of people say it's because they didn't have the voice and the articulation. So hopefully that's the difference. Hopefully that's the change." Thousands also took to the streets in Boca Raton - including even Canadian snowbirds like Jean Kesten, 62, of Toronto. "I don't understand why normal, everyday citizens can pick up [an assault weapon] they used in Vietnam," said Kesten. "I don't understand why kids and adults can have a gun like that." 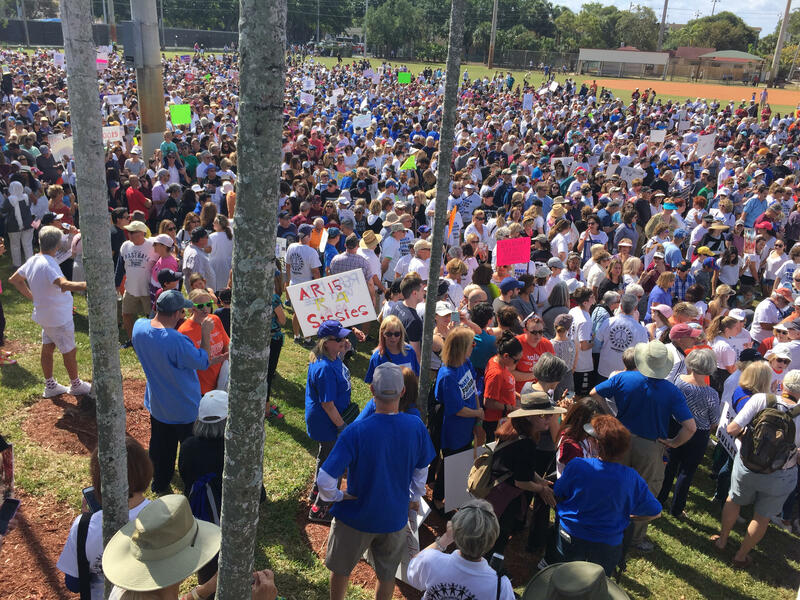 Thousands of people gather at the baseball fields behind City Hall in Boca Raton to start the March For Our Lives event there Saturday morning. 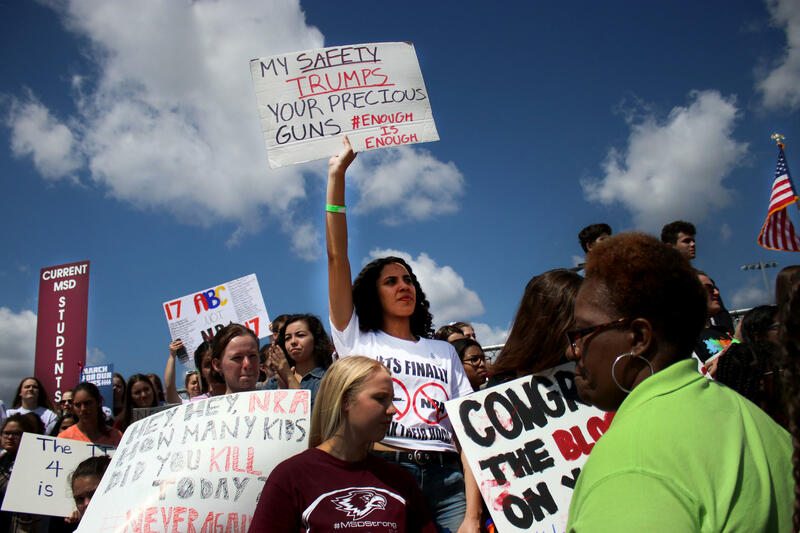 The Boca Raton protesters concluded their march at the Mizner Park Ampitheater for a rally for gun control and to honor the Parkland shooting victims. "I'm here to support the movement," said Ana Louis, 50. "I'm not against guns. They have a purpose. But it's not for killing individuals." 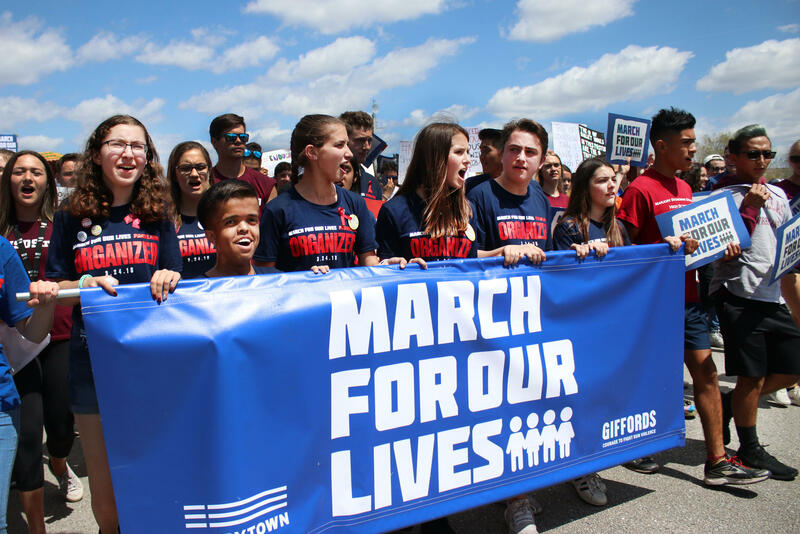 Louis' 13-year-old daughter Sophia said she felt moved to become more civic-minded, especially on the gun issue: "We need to make sure we are heard now, wherever and whenever there's an opportunity." Ana Louis (eft) and daughter Sophia at the Mizner Park Amphitheater at the end of the Boca Raton march. At the other end of South Florida in Key West, Police Chief Donie Lee came out in solidarity with the march there: "These kids are making change," Lee said, "and I want to be part of it." 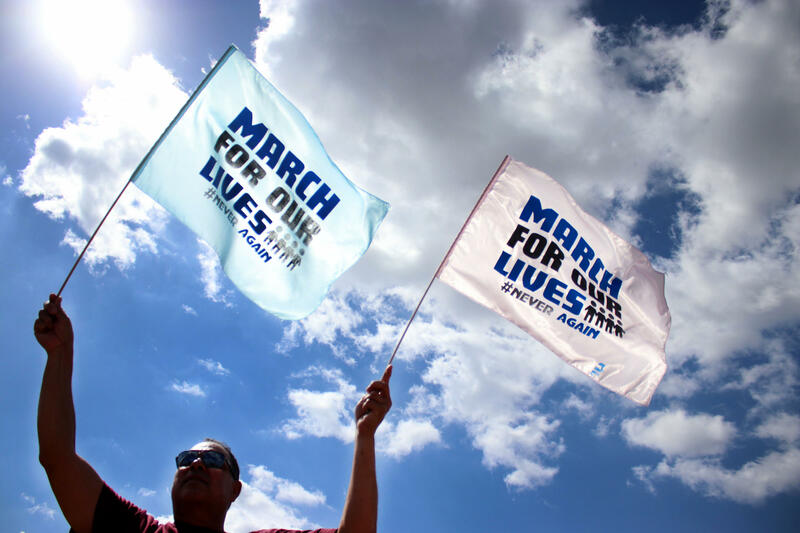 March For Our Lives demonstrators start their event in Key West Saturday afternoon. Iconic, 98-year-old Key West resident David Wolkowsky led the marchers in his vintage Excalibur convertible. "I'm just here to keep the world out of trouble," he said. Among the marchers was Nadine Smith, executive director of the LGBT rights group Equality Florida. The March For Our Lives happened to coincide with her organization's Saturday night Key West gala, and she was wearing a blue T-shirt honoring the victims of the Pulse nightclub mass shooting in Orlando that killed 49 people. "The 49 who were taken from us and all of the survivors are in my heart today," said Smith. 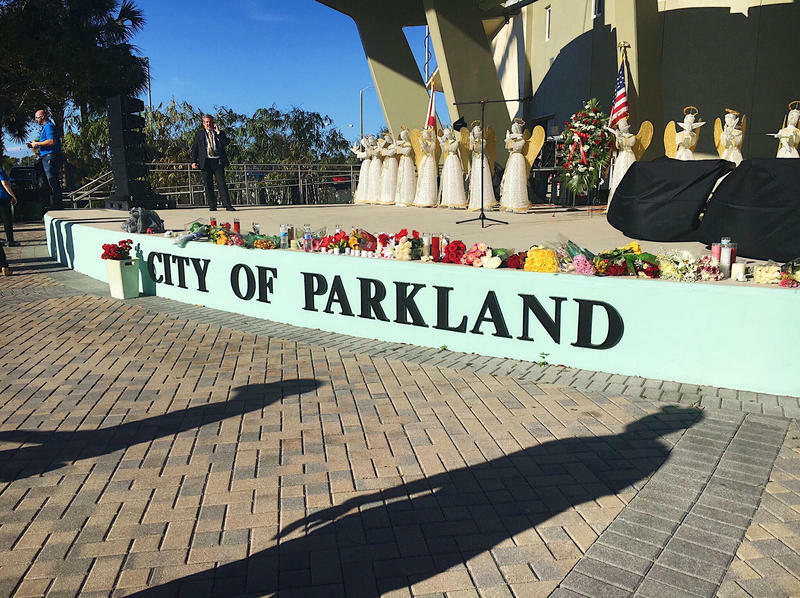 "I'm marching for them, I'm marching for the students in Parkland. "I do think this is a turning point. People are waking up to the fact that the NRA they remember is not the NRA of today. They think of it as Field and Stream and hunting and gun safety, when [today] it's really Soldier of Fortune breeding this gun culture, and more important paying off politicians or intimidating them into supporting an irrational gun policy that is quite literally costing lives." Equality Florida director Nadine Smith marching in Key West wearing a shirt honoring the Pulse nightclub shooting victims.